“It’s a lot simpler nowadays than in the past where I had to send out physical letters to people to get involved." A new pyramid scheme is taking social media by storm and promises big cash payouts for little investment. NBC10's Miguel Martinez- Valle explains how it works and what you need to look out for. It’s the latest version of an age-old scheme. One person invests $150, recruits 14 other people into the group and then walks away with $1,200. Each member of the group works their way to the big prize by recruiting more members, and so on. Sound familiar? 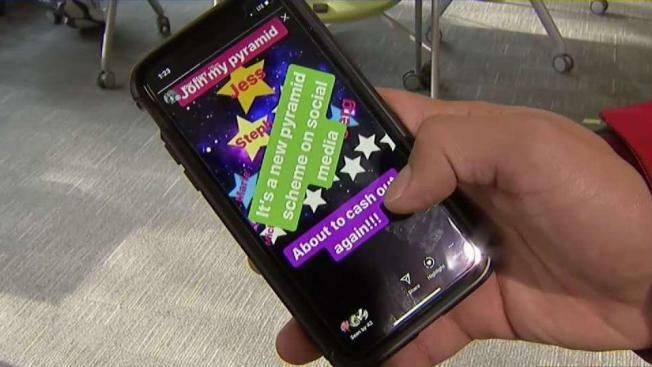 “This is a classic pyramid scheme, and we’ve been seeing pyramid schemes for centuries,” Rob D’Ovidio, associate professor of criminology and justice studies at Drexel University, told NBC10. The difference with this particular scheme is that it relies on social media and other popular smartphone apps. Participants are paid via Venmo or Paypal and recruit members using Instagram and Facebook. “It’s a lot simpler nowadays than in the past where I had to send out physical letters to people to get involved,” D’Ovidio said. A similar pyramid scheme was making the rounds on Snapchat at the end of last year. This one required participants to send a one-time joining fee using Snapcash. In theory, they would earn money when newer users sign on, but there was no actual guarantee and no goods or services were being exchanged other than paying into the scam. The holidays were an especially popular time for these types of schemes, according to the Better Business Bureau. “One seasonal scam that has returned this year is a gift exchange that's actually a pyramid scheme. Look out for this con on Facebook, Instagram and other social sites,” the bureau warned on its website. Like other social media scams, this one showed up on Facebook and Instagram feeds. It invites people into a gift exchange and asked them to spend $10 on a gift for a stranger. They would then receive as many as 36 gifts back. “The scheme relies on constantly recruiting new participants, making it mathematically impossible to sustain,” the bureau said. So what’s the harm in all this? The U.S. Postal Service considers this gambling. If caught, your social media account could be removed and the user could face fines. Don't take the bait. If it sounds too good or outlandish to be true, it's probably a scam. Be careful of shortened links. Scammers use link-shortening services to disguise malicious links. Don't trust your friends' taste online. It might not actually be them "liking" or sharing scam links to photos. Report suspicious links to the site. Whether on Facebook, Instagram or Twitter, report any suspicious posts or activity to the site by going to their help link.